The newly revised Yaris is just going on sale with an entry price level of €14,995 for the Terra 1.0 VVT-i Manual three-door and a similar spec and engined five-door version for €15,995. 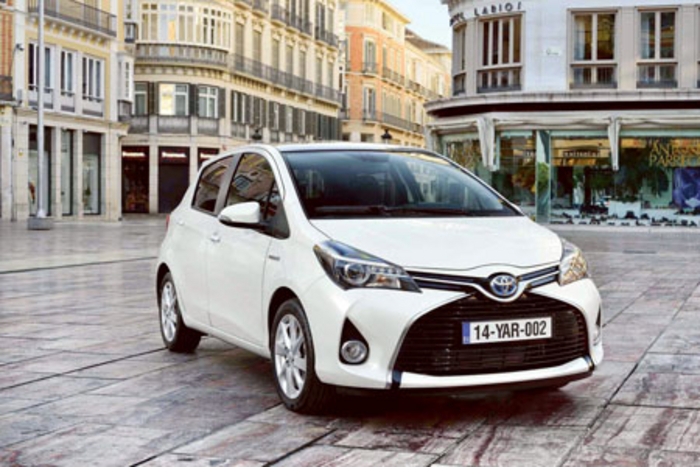 The entry level diesel version is a Luna 1.4 D-4D Manual five door for €18,570 and the starting price for a new 2014 Yaris Hybrid has a price tag of €19,500. The new Yaris continues to be available with 1.0 VVT-i, 1.33 Dual VVT-i (with both six speed manual transmission and MultiDrive ), 1.4 D-4D and 1.5 Hybrid engines. However, Toyota tells us that each engine has undergone improvements to reduce CO2 emissions and noise and vibration levels. Stop and start system is no longer fitted on 1.33 versions. CO2 has been reduced on all the petrol engines in the revised Yaris. For example the 1.0 manual version sees a reduction of 12 grams to 99g; the 1.33 manual reduced by 6 grams to 114g, and the 1.5 hybrid - reduced by 4 grams to 75g. The diesel 1.4 D-4D remains at 99g. Toyota tells us that the new Yaris will now have Toyota Touch 2 version from Luna grade up. The Touch 2 for Yaris now incorporates a 7” screen (vs outgoing 6.1” ), and the system has an improved menu display in higher resolution, and a more intuitive interface and includes the new Mirrorlink feature, as seen on Corolla, RAV4. This has meant that the six-speaker CD audio with USB connection (Aux-in has been discontinued ) is standard on Terra and Aura versions but had to be removed on the higher spec versions to allow for the 7” touch screen. Another improvement for the new 2014 Yaris is the location of the USB connection. Previously, it was located in the glovebox but for now it has been moved to the centre console (under the heater control panel ) and is easier to access. The specification grades availability for the new Yaris continues to be: Terra, Aura, Luna, Sol, Hybrid and Hybrid Luxury. There is also an optional Lounge pack available for the Sol but it is not offered with fire red, island blue, or light blue body colours.